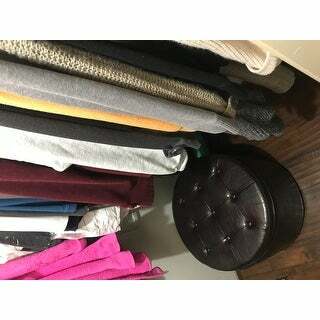 I loooove this shoe storage ottoman! I use my ottoman for a make up chair with my vanity. The shoe storage is an excellent bonus! Its perfect height and stores all my extra little shoes! I am very pleased with my purchase. 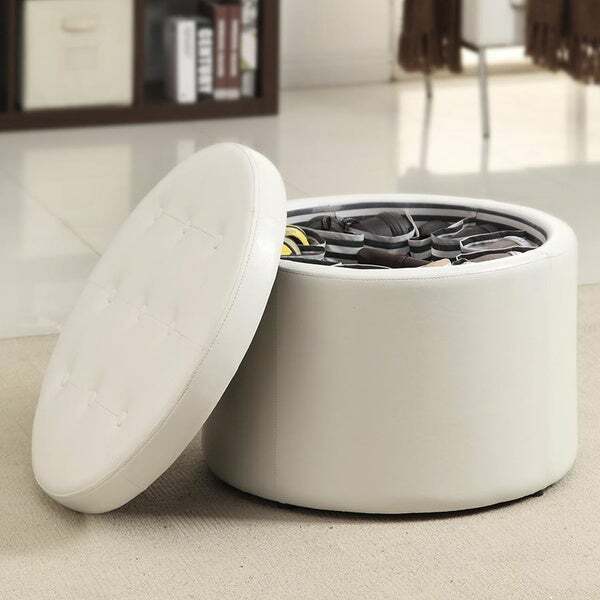 Extend your storage space with this decorative shoe ottoman by Porch & Den. With twelve separate shoe compartments, this ottoman holds six or more pairs of shoes or functions as a convenient space for TV remotes, magazines, and more. The sturdy wood frame and durable faux leather or fabric upholstery make this piece double as a comfortable footrest or extra seating option. Choose from a variety of colors in a classic button-tufted design to suit your personal decor style. Please note: Some options listed or pictured may be currently out of stock. All in-stock options are listed near the 'Add to Cart' button. Dimensions 22.0 In. X 22.0 In. X 16.25 In. I love this storage ottoman! It can hold so many pairs of shoes, and I also use the center to store my socks. The leather-like fabric is lovely and smooth, and looks like real leather. The cream is true to color. Highly recommend! Great little ottoman! It looks a lot more expensive than it was. Fabric and tufting is nice. Love the shoe storage option, but the little shoe slots can easily be folded flat to store anything. I am so pleased with my Porch & Den Bywater Congress Round Shore Storage Ottoman. 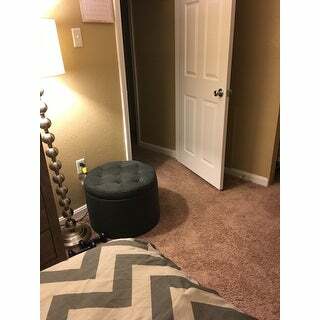 I have a place to store my shoes and know where they are. My husband is also pleased because he is not tripping over them. It make a nice addition to our small home and a nice way for us to use as extra seating and as a great foot rest. Many friends were surprised that it was a shoe storage. I told them were I purchased it. I bought this as I never have enough shoe storage. I really like the pockets inside but mainly good for sandals and smaller shoes. The center will hold another 4-6 pairs of shoes depending on shoe type. Overall would recommend it if looking for little extra shoe storage. Seems durable and good quality. I ordered 2 of these in the Blue Fabric, I store yarn in one and hide shoes on the other. They are amazing, nice a light so they are easy to move around. 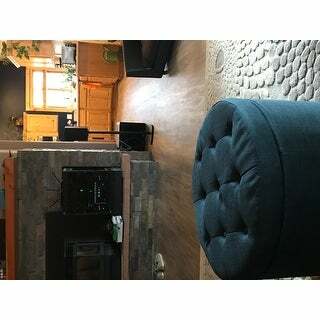 The color is true to the picture, such a nice deep blue, they match perfect with my slate fireplace and blue kitchen. The show material is a heavy canvas type material that won’t hold smell and clean easy. I am totally in love with these ottomans. I ordered two for my bedroom to use as storage as well as seating. The blend very well with my furnishings as well. The only issue is that the slots for the shows only holds 1 for high heels but for flats it will hold the pair. I absolutely love my ottoman..it was all i wa hoping it would be. I actually was able to fit 9pairs of shoes in it. A pair of shoes in each slot. The ottoman goes perfectly with my furniture. Perfect for my make up table. Good quality. I purchase the dark grey one and will say the color is true to the picture. Additionally holds a lot and I have not had a problem with it getting a "shoe" smell in it. 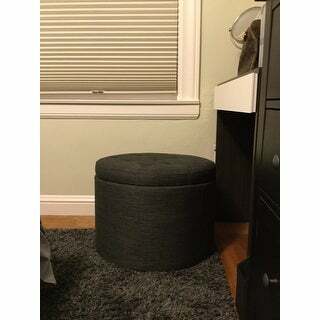 Great storage ottoman! Love the shoe holders inside! Very clever and functional! Great size too! Hopefully, the white will be easy to keep and Maintain. I have two of these and everyone loves them, excellent when I have events at home they served as seating and people is really comfortable. A few friends even asked about them and purchase some themselves. I ordered a few for them, and used them as gifts for other people. The fact that it holds 18 pair of shoes is really good, since there is never enough space for shoes and I can easily put away the summer shoes vs the fall shoes inside them. 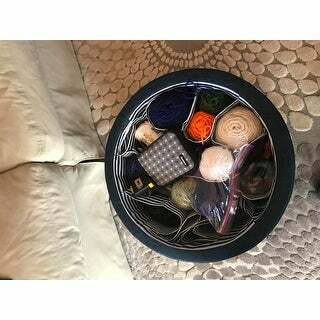 It can contain a lot of shoes with another function that you can sit on it or use it as a side table. The quality seems very nicer than the price I paid. It feels sturdy and safe. I wanted to get the fabric one but then I was afraid of my cat ruining the fabric so got the vinyl one and so far it still looks brand new! 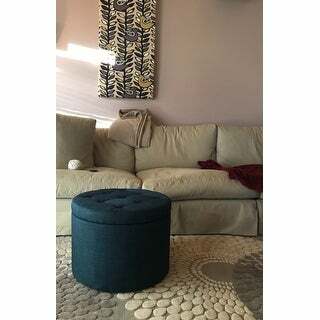 High quality ottoman... large and well built. Hidden storage with ample space for multiple pairs of shoes and/or other items. Good looking piece of furniture... would order again. In love with this ottoman. Now both my son and husband know where their shoes are lol. "Would it hold tennis shoes as well?" Yes, this ottoman can hold tennis shoes. "Can the sections for the shoe storage be removed if I don't want to store shoes in the ottoman or are they affixed to the interior of it?" The section for the shoe storage cannot be removed. "Can you please check with the seller of this item whether the item has been treated with chemical flame retardants ? Very allergic and need confirmation before purchasing. Can you also confirm whether the item is California 93120 formaldehyde complaint?" "can you fit boots are high heel shoes in it?" Not in the pockets but I laid my down folded in half. It holds quite a bit. I have one for shoes and one for boots. I've been very happy with the purchase. I have limited space and these turned out to be perfect. I would recommend. It does hold high heels, and you can store your boots in the center. There us a large space in the center perfect for boots. I love mine, and use it everyday to elevate my feet on. It has a LOT of storage space, and is sturdy enough for an adult to sit on. It holds high heels in the pockets, and I store my boots standing in the center. There is a LOT of space in the center. I use mine everyday to elevate my feet, and it is a very sturdy ottoman. I have sat on it and and it supported my weight. "What shade of blue and grey is it? " "I can't find a picture of the blue option. Even when I choose blue, it shows the ivory. Can you post a picture of the blue?" The blue is a dark blue - like a cobalt or midnight blue.